The 15 Best Fall Activities across North Dakota! As the wind gets colder and the leaves begin to turn colors, North Dakota comes alive. Those trying to enjoy all the state has to offer before the snow flies have plenty of options. Here are the top fall activities to do in the Roughrider state. Located in West Central North Dakota, the 70,446-acre national park is one of the state's greatest treasures. Part of the majestic Badlands, the park affords visitors the opportunity to see a plethora of wildlife-from bison, deer, and antelope to prairie dogs, eagles, and coyote. During the fall, the tapestry of colors displayed in the area is truly breathtaking. Whether you are interested in driving the scenic roadways, hiking a myriad of well-kept trails, or taking a guided tour, a visit to the park will help you understand why Teddy Roosevelt fell in love with the locale after his first visit. Considered one of the state's best kept secrets, the Maah Daah Hey Trail is a combination of unadulterated beauty and natural serenity. Located in the Badlands, the trail offers visitors the opportunity to enjoy a little bit of everything-rolling plains, tranquil rivers, majestic plateaus, and captivating valleys. Fall is particularly magnificent on the trail system, which is comprised of nine trail units of varying size and difficulty: The Long X (5.8 miles), Summit (3.8 miles), Overlook (0.3 miles), Maah Daah Hey (97 miles), Bennett (3.2 miles), Cottonwood (6.9 miles), Ice Cave (1.5 miles), Buffalo Gap (18.9 miles), and The Deuce (49 miles). Located on the North Dakota/Manitoba border, the International Peace Garden is exquisite. Created in 1932 as a promise of peace between the two countries, the superb nature of the Peace Garden lies in its quiet tranquility and magnificent beauty. Although a variety of wildlife call the area home, the garden is known for its vegetation, which include over 6,000 cactus and succulents. Add to that the spectacularly changing leaves and it is a site to behold. One of the state's most popular destinations, Lake Metigoshe is located in the scenic Turtle Mountains. The lake got its name from the Chippewa, who called it "Metigoshe Washegum," or "clear water lake surrounded by oaks." The 1,151-acre park has both modern and primitive camping facilities, picnic areas, a variety of groomed trails, and the picturesque beauty the area is famous for. Few places can equal the park's combination of rolling hills, aspen trees, and tranquil water. When the temperature starts dropping, and sometimes very quickly, a visit to West Fargo's Pioneer Village may be in order. Nowhere else can you get a first-hand look at what life was like in the 1800s. Step inside an authentic blacksmith shop, cozy up to the bar at the Brass Rail Saloon, try to imagine a typical day at the Dobrinz School, or stroll through the Law Enforcement Museum. Few activities will make you more grateful for the contemporary luxuries that are so easy to take for granted. Bonanzaville is open year-round and portions can also be rented for special occasions. A thirty-mile stretch of roadway, the Enchanted Highway is North Dakota's most unique attraction. Local artist Gary Greff began building the large scrap metal structures in 1989 and plans to continue adding to the collection. The Enchanted Highway begins with "Geese in Flight" on exit 72 near Gladstone and continue on until "Tin Family" near Regent. In the middle you will find "Deer Hopping," "Grasshoppers," "Fisherman's Dream," "Pheasants on the Prairie," and "Teddy Roosevelt Rides Again." Another gem found in Western North Dakota, the 64-mile byway is additional way to take in the natural beauty of the state. Within the stretch of road, you will also find the Lake Ilo National Wildlife Refuge, where you can catch a glimpse of the wildlife that calls North Dakota home. You can also find the Killdeer Battlefield State Historic Site where the Sioux Indians fought during the Civil War, Little Missouri State Park, which provides unparalleled views of the Badlands, and the Crow Flies High State Recreation Area, which offers panoramic views of the Four Bears Memorial Bridge and Lake Sakakawea. A trip aboard the Lewis & Clark Riverboat will provide you with an incomparable and authentic North Dakota experience. Part of the Fort Abraham Lincoln Foundation, the riverboat will take you on a beautiful 1-2-hour cruise down the serene waters of the Missouri River. In addition to its public trips, the riverboat can also be rented for private parties. The Big One Art & Craft Fair is one of the state's premier events. Peruse the wares of local artists and get a head start on your Christmas shopping, especially for those on your list that are hard to shop for. Items typically found at the show include everything from homemade candles, pottery, and jewelry to baked goods, soaps, blankets, and clothing. With a tradition that spans over forty years, the Big One is the place to be come November. Separate shows are held in Grand Forks, Minot, Bismarck, and Fargo. Stop by the Fargodome for the opportunity to watch the five-time national champion Bison football team. Yes, five championships in a row. There isn't a better show. Nothing says fall like a visit to a local pumpkin patch. North Dakota has a plethora of patches that offer everything from corn mazes and hayrides to contests and games. Every November, the small town of Garrison transforms itself into a Victorian-style community from the era of Charles Dickens. Garrison, known as the official Christmas capital on North Dakota, has embraced this festival for over 20 years. The highlight for many visitors is a ride on Queen Elizabus, a cherry red double-decker 1960 English bus. Other events include Treats with Tiny Tim, English High Tea, carriage rides, the Dickens Wine & Cheese Tour, live stage performances, a lighted parade, and of course, lots of delicious food and drink options. The NDSU Bison are not the only sports team in town. Every Friday, towns of all sizes are transformed into football attractions. If you have never seen a high school football game, you are missing out. As was portrayed in the hit movie Friday Night Lights, nothing brings a community together faster or more fervently than the gridiron. North Dakota has long been a favorite hunting destination for both locals and visitors. In fact, the November opening of the deer hunting season is often considered a literal holiday. Whether you like to hunt waterfowl, big game, migratory game birds, or furbearers, North Dakota is the hunting locale you've been looking for. 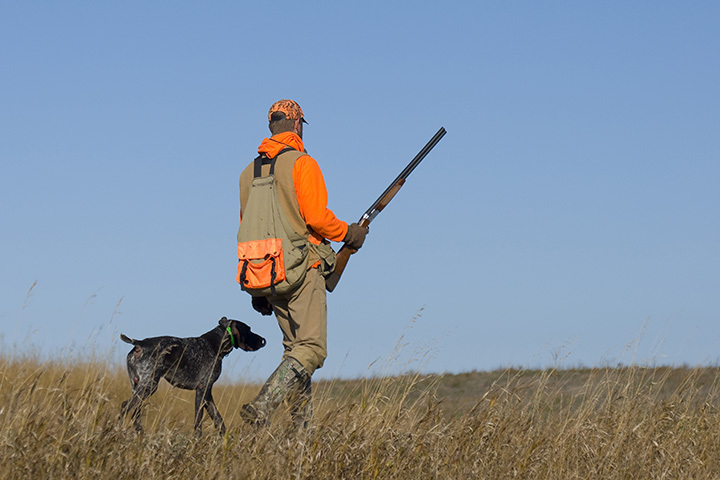 Before participating in any hunting expedition, be sure to check opener dates and licensing requirements.